It’s almost a poison chalice being the support act for a band as ‘big’ as the Proclaimers. You go on for half an hour while people are wandering into the venue with pints and Pepsis, you work hard, you get minimal lighting, you get polite applause with maybe a few whoops, then when you go off there’s at least half an hour before the headline act. This honour fell to East Kilbride’s Declan Welsh tonight, so he deserves a mention. Declan’s a one-man act, belting out songs, accompanying himself with simple attack-chords on a guitar with fence-wire strings, pausing only to explain that the 66 bus goes from near his house to Glasgow City centre, and that his song ‘She’s from Bearsden’ is all about feeling inadequate. His voice sometimes sounds a wee bit like one of the Gallagher brothers and sometimes a wee bit like Marc Bolan and – respect to him – he gave us one hundred percent, absolutely delighted to be on that stage. He has some stuff on YouTube, so go looking. Now, events where you’re in a venue packed with bouncing, cheering, uncritical fans of a headline act are ten-a-penny. Events where you’re in a venue packed with bouncing, cheering, uncritical fans, and the headline band cracks out twenty-two damn good songs with little chat in between except to read out dedications for members of the audience, and then does three encore numbers, are very, very rare. That’s one reason why it was a privilege to be at Perth Concert Hall for the Proclaimers tonight. They opened with ‘Sky Takes the Soul’, instantly establishing a strong position on stage. Fans didn’t have to wait long for their first ‘biggie’, as ‘Letter from America’ came up third. That was the point at which I first became aware that their voices are no longer young – some of the whoops and yodels weren’t there – but as the evening went on and the overall strength of the performance became obvious, that just didn’t matter. Generally, if a band has a new album out there’d be a kind of tension in the air. There’d be frequent, even desperate, announcements to the effect “This is a track from our new album…” Another strength the Proclaimers have is that they don’t do that. They have more than thirty years’ worth of brilliant material to draw on, and they seem to pick from that without even thinking about it. The set contained only a small handful of songs from ‘Let’s Hear It For The Dogs’, and the feeling was that they just didn’t need to advertise. Throughout the set, from song to song, there were nods to folk, 1950s pop, country, and yet they remained, as always, resolutely Scottish. The lasting impression was of superb songwriting skills, as you would expect; in that respect, if I were asked to name a songwriter in whose league they were, I could say maybe Dave Grohl, maybe Brian Wilson. Yes, that good. But if you are a fan you don’t need me to tell you that. Naturally – predictably – the last song before walk-off and encores was ‘I’m Gonna Be (500 Miles)’. We were all bouncing, cheering, and singing along to that. Well, it is Scotland’s unofficial national anthem and terrace song. 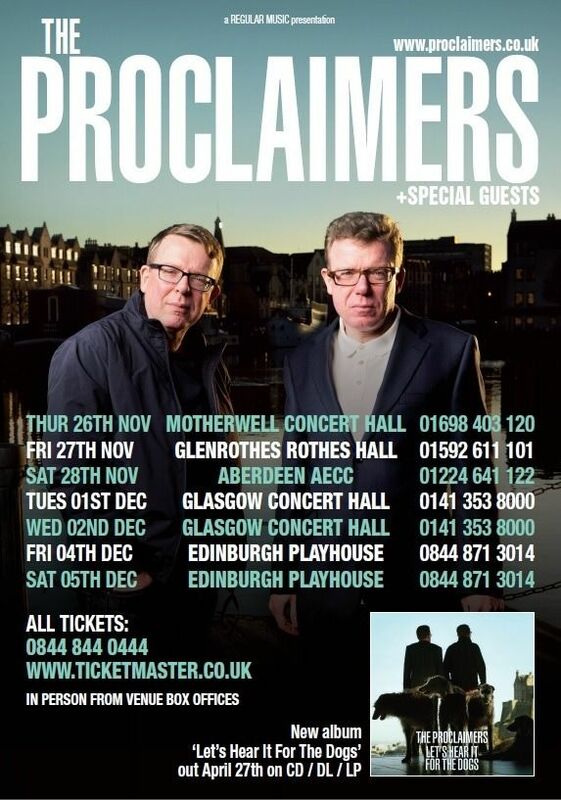 If the Proclaimers have passed you by, however, as they did me for a long time, then don’t worry, just rectify that. Go hunting on YouTube for a start. Better still, put the dates December 1st and 2nd (Glasgow), and 4th and 5th (Edinburgh) in your diaries.